No more HANGRY kids! We found 55 stores that give kids free snacks! Do you dread taking your kids to the store because they fuss, fidget and act up when they see all that food! It’s enough to make anyone instantly hungry. So, what’s a busy mom or dad to do? We did the footwork for you, and as a result we have this great list of stores that offer free snacks for kids! Some grocery and retail stores offer freebies for kids! There are free fruit for kids and free snacks for children programs – or clubs – you can join. Like a loyalty program, or a program especially for kids to get free things. Others make it simpler, offering your children free fruit or snacks just for the asking. Some post signs, or have a designated basket with freebies. Don’t see your store listed here?Look around at your store, and don’t be shy! Ask them if they offer kids’ snacks. It could make your shopping trip a little more pleasant. Check with the service desk at your store to see if they have any free stuff for kids. Please keep in mind that not all stores have the same policies. Availability may vary by different stores, and by various locations of the same store. The type of snacks offered varies by store, and can change over time. They may include sweet treats, cookies, fruit, snack bars, and other items. Albertson’s – If you sign your child up for Munchsters Club, then they get a free piece of fruit with each visit . Amigos – offers free fruit for kids. Request your freebie in the produce department. Baker’s – check with your location to see if they participate in the Kroger Kids Fresh Friends card. If they do, you’ll get a free piece of fruit each month. City Market – check with your location to see if they participate in the Kroger Kids Fresh Friends card and get a free piece of fruit each month. Cub Foods – While you’re grocery shopping, ask for a piece of free fruit in produce department, or for a cookie in the bakery department. Dierbergs – If your store has a bakery, ask for a free cookie for your kids. Dillons – check with your location to see if they participate in the Kroger Kids Fresh Friends card and get a free piece of fruit each month. Farm Fresh – join the club and get a Healthy Eater Fruit Card which entitles your child to a free piece of fruit when you shop. Food Farm – Stop in at the produce department and ask for your free fruit for kids while you shop. Food City – sign up for Kids Club for free fruit and more. Sign up for Cookie Monster Club for free cookies. Food Lion – free cookies for kids at the bakery. Request in store. Food Pyramid – free cookies for kids. Request at the bakery dept. Fred Myer – free fruit for kids while shopping. Look for their “Fruit Stand” in store. 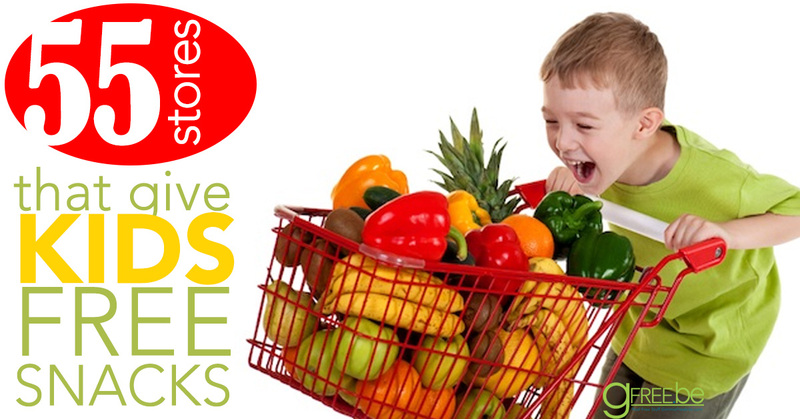 Fry’s – look for the Free Fruit for Kids Cart in produce department. Gerbs – check with your location to see if they participate in the Kroger Kids Fresh Friends card for a free piece of fruit each month. Gerritys – free fruit for kids. Sign up for Kids Club program at service desk. Giant Eagle – you can purchase a Little Shopper Treat card for $1, which entitles kids ages 10 and under, to choose from one of the following FREE treats: a piece of fruit from produce, a slice of cheese from deli or a cookie from bakery. Proceeds go to local children’s hospitals. Giant Food – free fruit for kids 10 and under. Look for Fruit Basket in Produce. Giant/Martins – free fruit for kids. Request in produce dept. Harps – free fruit for kids. Request in store. Harris Teeter – kids can get a free balloon or a cookie. Look for their stand by the service desk. HEB – free fruit, cheese for kids. Request at deli and produce depts. Hilander – check with your location to see if they participate in the Kroger Kids Fresh Friends card for a free piece of fruit each month. HyVee – free fruit for kids, check with your local store for participation. Ingles – free cookie for kids at the bakery dept. Request in store. JayC Foods – check with your location to see if they participate in the Kroger Kids Fresh Friends card for a free piece of fruit each month. Jewel Osco – sign your child up for their Healthy Eaters Free Fruit Club Card. Stop at customer service desk to get the card. King Soopers – free cheese slice. Request at deli. And check with your location to see if they participate in the Kroger Kids Fresh Friends card for a free piece of fruit each month. Kroger – get a free Kids Fresh Friends card for a free piece of fruit each month. This may include all affiliate stores too: Kroger’s, Ralphs, King Soopers, City Market, Dillons, Smith’s, Fry’s, QFC, Baker’s, Owen’s, Jay C Food Stores, Hilander, Gerbes, Food4Less, Pay Less Super Markets, and Scott’s Food & Pharmacy. Market Street – sign your child up for Munchsters Club. Kids get a free piece of fruit with each visit to store. Marsh – free weekly treat. Sign children ages 4-12 up for Kids Club, to get freebies. Meijer – check with your local store for participation. Free cookie for kids at bakery. Owens – check with your location to see if they participate in the Kroger Kids Fresh Friends card for a free piece of fruit each month. Payless Super Markets – check with your location to see if they participate in the Kroger Kids Fresh Friends card for a free piece of fruit each month. Piggly Wiggly – free fruit for kids. Price Chopper – check with bakery for free cookie. Request in store. PCC Natural Markets – free fruit for kids. Request in store. Publix – free cookie for your child at Publix bakery. You have to request it. Raleys – free fruit for kids. Request in store. Ralphs – free balloons for kids at participating locations, and check with your location to see if they participate in the Kroger Kids Fresh Friends card for a free piece of fruit each month. Safeway – head to the service desk and request a free fruit card – redeemable for a free banana, and a Cookie Card – redeemable for a free cookie! Schnucks – free cookie for kids at bakery dept. Scotts Foods – check with your location to see if they participate in the Kroger Kids Fresh Friends card for a free piece of fruit each month. Shoprite – free cookies for kids. Go to the bakery and ask for one. Smiths – check with your location to see if they participate in the Kroger Kids Fresh Friends card for a free piece of fruit each month. Stop and Shop – free fruit for kids. Request in store. Super Target – free fruit or cookie for kids. Check to see if your store is participating. United Supermarkets – free fruit for kids. Request in store. Vons – free bakery treat for kids. Request at bakery dept. Wal Mart – check with your store’s bakery dept or produce department for possible free fruit or cookie for kids. Weis Markets – free fruit for kids in produce department. Request in store. Wegmans – free apple or cookie for kids. The bin can be found in the bakery dept. Whole Foods – stop at Customer Service and pickup a Kids’ Club Coupon good for a complimentary organic apple, 100% Organic fruit leather, or natural animal crackers. Winn Dixie – free cookie for kids. Request at bakery dept. Know of any we missed? Let us know in comments!